During my stay here in Anchorage, Del Salyer at Alaska Scientific was gracious enough to allow me to stay these few days in his “bachelor’s pad” on the mezzanine level of his warehouse – quite a comfortable spot overlooking the many medical products he keeps in stock for the remote villages and towns across the entire state of Alaska. The area is well-furnished with all the ammenities including a very comfortable recliner as a sitting & work area. Accommodations include a fully-stocked kitchen area complete with refrigerator, microwave and everything you might find in your own home. The bathroom is spacious and includes a sink, toilet and a unique bathing & showering system developed exclusively by Del; comes complete with 2 different size bowl depending on the amount of rinsing water required along with a spacious plastic tub to collect the water. Friends now call me…Sponge Brad, Square Pants! Honestly, the area is very quiet and comfortable providing me with some much needed rest and relaxation before I begin the next marathon leg of Rally Around the World across Korea, Russian and eastern & western Europe. Anchorage offers excellent dining and lunch was no exception at Southside Restaurant with Del & Sharlane – I had the pasta in chipolte with andouille sausage & sundried peppers…pretty tasty. We continued our discussions on the state of healthcare reform and the possible impact on the Alaskan market along with new lab, products NDC has in the pipeline. For dinner, Del & Kim invited me over to their home for grilled salmon, shrimp and vegetables along with black & brown rice and salmon sushi caught fresh in the Russian River by Kim’s cousin – believe I could have that sushi for breakfast! Kim, Del’s wife, is a very petite, amazing and exciting woman to talk with and has had so many adventures including a bear scare while fishing for salmon in the area, crashing a Piper Cub airplane (says that one cost her quite a bit of money) and owning a Harley Davidson Dyna Glide that she bought new and has only ridden 9 miles after driving off the showroom floor – the bike is in pristine condition in one of her out buildings not being touched for 8 – 10 years….just terrific stories and a joy to be around. 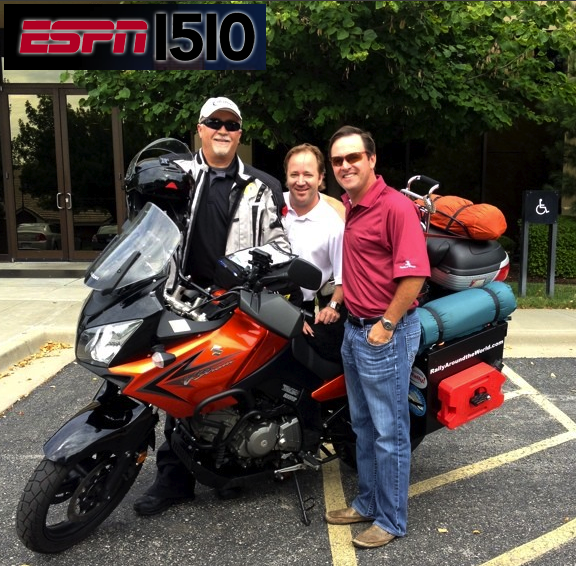 Joined Brian “Sully” Sullivan and Patrick Madden this morning for their Monday morning ESPN Talk Radio Program on 1510AM in Kansas City…finally got the opportunity to truly see firsthand just how wacky & unbriddled Brian can be – are you kididng me?! He was the same ol’ Brian we all have known for years – this visit only confirmed for me his unique talent of harnessing his audience. Thank you Brian & Patrick for allowing me to pitch Rally and the tremendous work these folks do. As you might expect, the highlight of my day was visiting the kids and meeting Ema and her Mom was no exception. 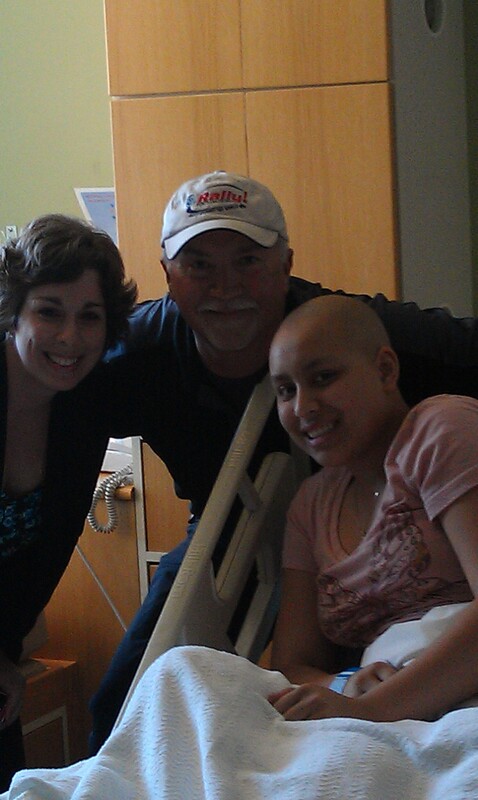 Ema is a young woman diagnosed with Ewing’s sarcoma on her 16th birithday and as she put it sarcastically, “that was my 16th birthday present.” I enjoyed hearing from Ema’s Mom on all the challenges families face when a child is diagnosed with cancer. I was also fortunate to chat briefly with a young man named Dustin who was having his first round of chemo after completing radiation therapy. It was in Dustin’s room I couldn’t help but notice that with each child I had visited these last fews days, there was one common element – a parent was always in the room and in most cases living alongside their child daily…suitcases, clothes and mostly the hopes & fears so visible in their eyes. A special thanks to each of the families allowing me to briefly peek into their lives…these are the kinds of things that make a difference to me and only help to solidfy my resolve to expand awareness for these kids. 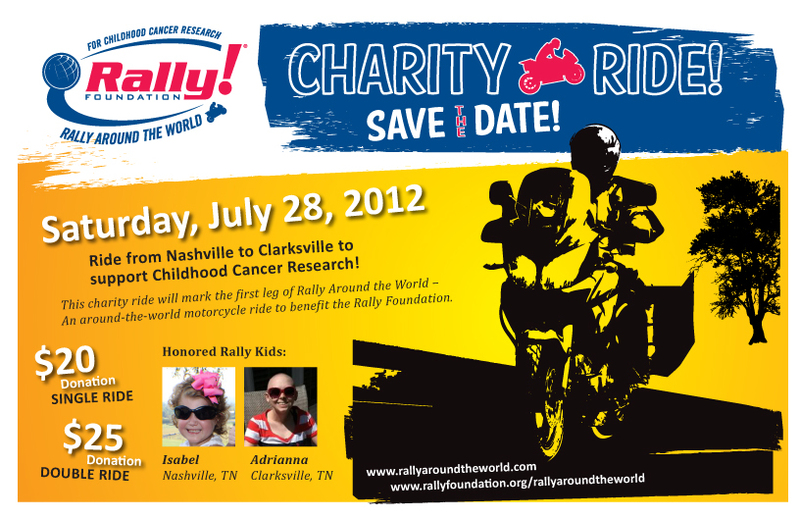 Rally Around the World Kick-off Event launches on Saturday, July 28 with a first-leg charity ride from Nashville to Clarksville, TN honoring Rally Kids Isabel & Adrianna – childhood cancer fighters. The ride will conclude with an event hosted by Mid-South Motoplex ihn Clarksville, featuring music, raffle, food and drinks. 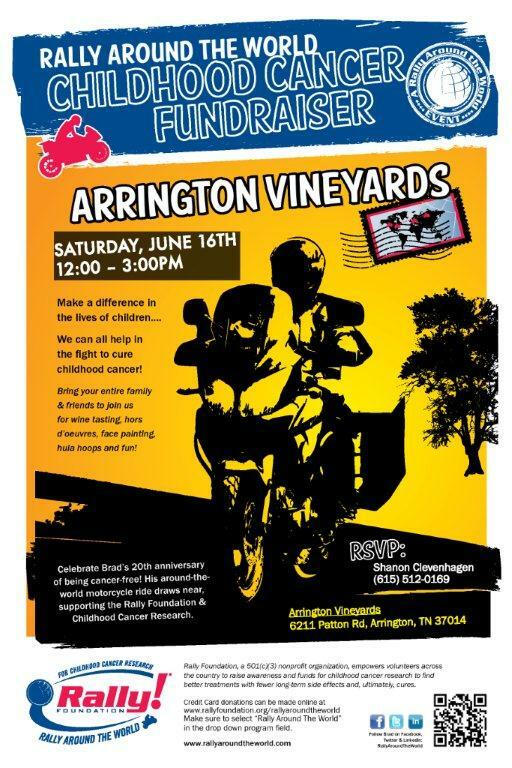 Registration begins at Cool Springs Powersports in Franklin TN at 9am – 10:30am…$20 donation for Single Rider & $25 for Double. Ride departs from Cool Springs Powersports at 10:30am arriving at Mid-South Motoplex around noon. Cool Springs Powersports is located at 1096-1124 West McEwen Drive, Franklin, TN 37067 and Mid-South Motoplex is at 730 Economy Drive, Clarksville TN 37043. The event will mark the first-leg of Rally Around the World – an around-the-world motorcycle ride to benefit Rally Foundation. 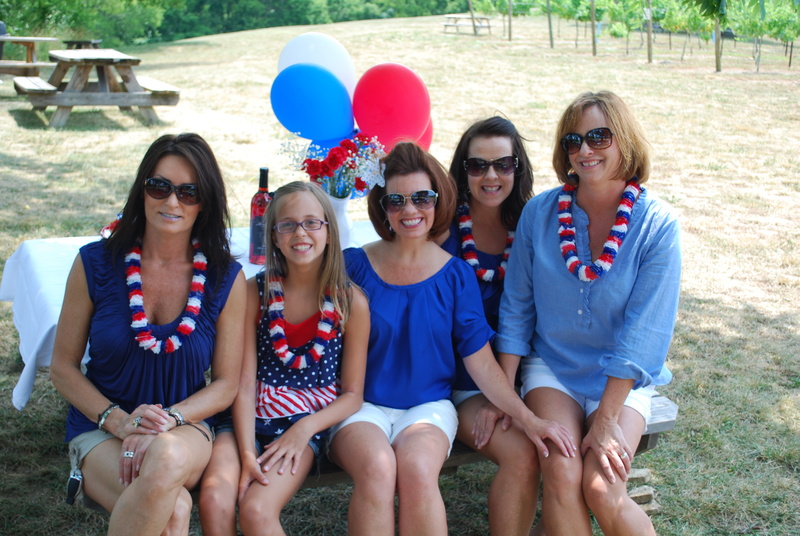 About 50 family, friends & co-workers joined us at Arrington Vineyards on a beautiful Saturday afternoon to celebrate Rally Around the World with a red, white & blue-themed fundraiser for Rally Foundation. Shannon did an awesome job arranging all the details including balloons, table cloths with flowered center-pieces, Arrington wines, appetizers, drinks for the kids, hula hoops, bubbles, and a silent auction – the attention to detail was incredible! 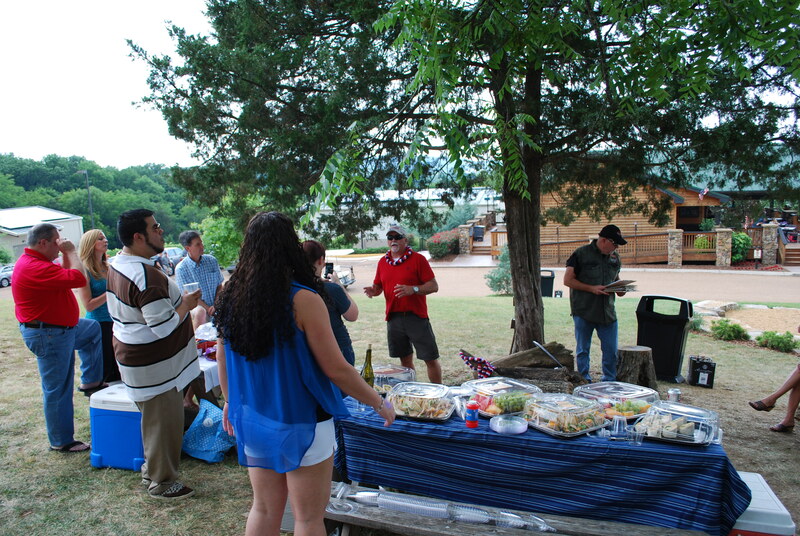 The kids played, while their folks enjoyed wine tasting, food, drink and just a nice relaxing afternoon. Silent auction items included a Kix Brooks autographed bottle of Arrington Vineyard wine, a gift card from Textured Salon, a humidor & cigars from Cigar Station, earrings by Fabrik and Mad Mac’s coffee gift packages.